Whenever I think of slimming food, I think of green bean. I’ve ever came across an article on how green bean helps in slimming effect. 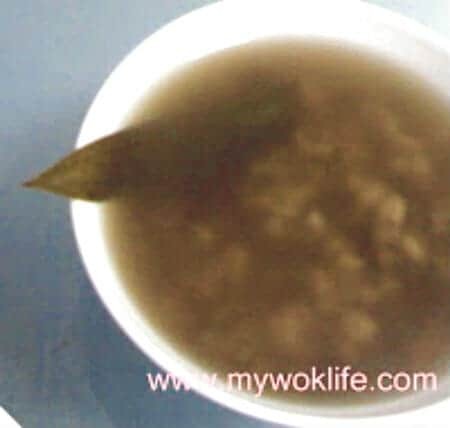 A bowl of green bean paste/ soup (without sugar added) to be taken daily helps to lose weight. Result will be seen as fast as within a week. Frankly, I am not quite sure if it is so real. Based on my experience, it helps a little. Was it due to the green beans? Probably yes, as it aids digestion, afterall. Anyway, green bean offers nutritional benefits. Chinese believes in its “cooling effect” to our body, green bean aka mung bean, has also asserted to its nutritional fame. (See more details). By adding some whole grain barley to the pot, it further improves our health alongside an enhanced flavour of the soup, with its appealing chewy and paste-like consistency. Barley helps to reduce water retention in the body, too. 1) Wash green beans in running tap water. 2) Place beans in a pot of water. Bring beans and water to a boil over medium fire. Cover with lid. 3) Briefly wash pearl barley, and place in the pot, when water boiled. 4) Tie Pandan leaves together into a knot. Add in Pandan leaves and rock sugar into boiling water. 5) Reduce heat to low fire, simmer for about 45 min to 1 hour, or until beans have slightly expanded out of their skins. Texture of beans and barley should be soft and fluffy. With just 3 Pandan leaves added in the soup, the Pandan flavour will not be over-whelmed. It added just extra fragrance to the soup, and in your palate. A bowl of green bean and barley dessert soup counts about 200kcal. Yes, I cooked a pot of green bean soup early this morning. Brought some to work for my colleagues as well, and it was a hit as green bean soup makes good breakfast (or rather good late breakfast… chuckling), too! 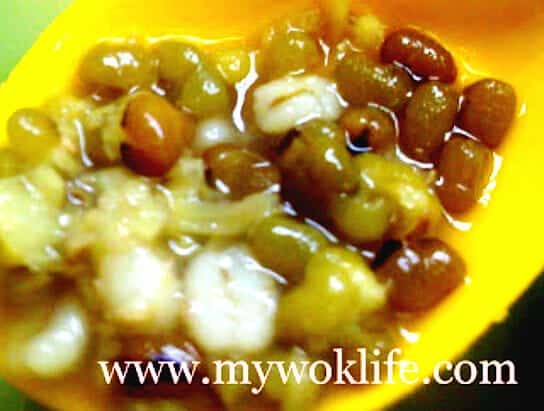 Tips: Ratio of water : beans/barley should be 3 : 1. *Add more water and/or sugar, if necessary. This certainly is an interesting soup, I thought it was savoury by the look of it but when I read the post and recipe I realized it was sweet…even better! It can be cooked salty (add salt) instead of sweet one. Sometimes, I will just eat it without any seasoning. Bland one with just its natural taste. However, I prefer sweet soup as I like to use rock sugar.. Rock sugar helps to improve complexion! If its slimming, I’m all for it! I didn’t realise green beans were slimming :) Very good to know!